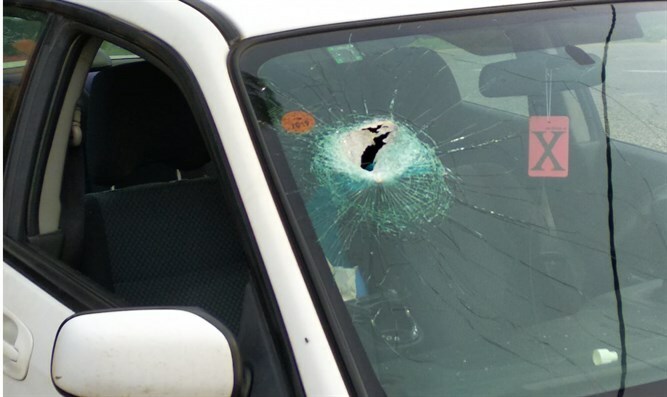 Terrorists throw rocks at car near Halhul, injuring nine-month-old. A nine-month-old baby was lightly injured on Tuesday afternoon when Arab terrorists threw rocks at a vehicle in which he was travelling near Halhul, south of Gush Etzion. Magen David Adom paramedics who were called to the scene treated the baby and evacuated him to the Shaare Zedek Hospital in Jerusalem. Security forces were called to the scene. On Sunday, a 24-year-old woman was lightly injured in a rock attack near the community of Eli in the Binyamin region. Paramedics provided her with medical treatment and evacuated her to the Shaare Zedek Hospital in Jerusalem with a face injury caused by rocks and glass fragments.